On December 26 2016, China’s Draft Ecommerce Law was issued by the Standing Committee of the National People’s Congress (NPC), with an invitation for public comment within 30 days. On December 26 2016, the Standing Committee of the National People’s Congress (NPC) issued the first draft of China’s first Ecommerce Law, with an invitation for public comment within 30 days. The IP-related provisions in the draft law have attracted mostly negative feedback, with trade mark owners raising concern over provisions that seem designed to dilute the duties of care already applicable to online trade platforms. Although there is no stated timeline for the law’s final promulgation, it is rumoured that the legislature and central government regard the law as a critical tool for regulating online trade. There is therefore a good chance the law will be enacted by the end of 2017. The draft law implicitly retains the traditional duty of care that requires online trade platforms to take down ads for offending goods following the receipt of notice from the IP owner. Industry has instead recommended that the NPC consider adopting a more progressive duty of care for online trade platforms – one which requires them to take reasonable measures to prevent infringements, also known as “proactive measures”. This proactive measures standard has in fact already been accepted by judicial authorities in Beijing, as reflected in a 2016 opinion (the Beijing High People’s Court Guidelines on Trial of IP Cases involving Networks). But this judicial opinion is technically only applicable to disputes raised before the courts in Beijing. Industry argues that the need for a proactive measures standard for online platforms is justified based upon the growing levels of counterfeiting, the limited capacity of most IP owners and government authorities to cost-effectively police the web for violations, the balance of convenience, and the fact that online trading platforms in most countries – and particularly China – are now mature and financially able to bear greater burdens with respect to online policing of IP rights. China’s leading online trade platforms are lobbying for retention of the current notice- and-take-down standard. But many leading Chinese platforms have in fact been applying proactive measures to prevent infringements for some time now via big data monitoring, filtering and other means. Article 53 of the draft law would require online trade platforms to stop infringements only after they are deemed to “clearly” or “actually” know of violations (明知). By contrast, other Chinese laws adopt the lower standard of “knowledge” (see Article 36 of the Tort Liability Law or Article 52 of the Trade Mark Law). Judicial decisions also make reference to a standard of deemed knowledge (“knew or should have known” or “明知应知”) that creates a duty for intermediaries to intervene against infringements. IP owners fear that the higher standard for notice under Article 53 of the draft law will embolden both platforms and vendors to push back against take-down requests citing the lack of airtight evidence that goods are counterfeit or infringing, and undermine the current custom under which platforms take down suspected fakes with limited fuss, thus shifting the burden to infringers to prove the goods are non-infringing. Article 53 of the draft law indicates online trade platforms may continue offering infringing goods if the vendor offers a “statement … guaranteeing” that the goods are not infringing. If the vendor provides this guarantee, the IP owner’s only recourse under the draft law is to file complaints with the courts or administrative enforcement authorities – a process that normally takes several months or even years. While not explicitly stated, it is possible that the NPC drafters intended Article 53 to apply only to more complex IP disputes, such as patent violations, infringements of unregistered trade marks and trade dress and contractual matters where the merits of the rightholder’s case are less clear. However, on its face, this provision appears to offer an unwarranted safe harbour for any sort of dispute involving an online seller – including counterfeiting. As a result, industry comments on Article 53 have highlighted the risk that platforms and vendors will abuse the proposed guarantee mechanism, thereby making policing impractical. It is unclear whether, once a guarantee has been given by the vendor, Article 53 would offer a trade platforms protection against compensation claims from IP owners once the dispute has been finally adjudicated by relevant authorities. Industry comments have noted that the risk of such liability should remain, since trade platforms would otherwise be incentivised to give vendors greater opportunities to give guarantees to facilitate continued sales. The draft law is clearly intended to regulate advertising, sale and other services conducted through traditional online trade platforms. But it is unclear whether as the draft is intended to cover other online businesses where goods are advertised, including social media, messaging apps, stand-alone websites and search engines. Industry comments on the draft law have naturally recommended a broader scope of coverage. The draft law also leaves unclear whether it is intended to cover only domestic transactions or also advertising and sales targeting foreign buyers. Article 88 of the draft law allows unspecified administrative authorities to impose fines of Rmb30,000 to Rmb500,000 ($4,400 to $74,000), and in serious cases to cancel the business licences of platforms that have failed to act against infringements despite having “clear/actual knowledge”. While these provisions are laudable, the draft law fails to clarify the role of administrative enforcement authorities in dealing with individual infringements or in broadly supervising the work of platforms in protecting the rights of IP owners and consumers. The law also leaves unclear whether administrative enforcement authorities have the legal authority to request evidence held by platforms and other parties (including payment services, banks, shipping companies and email service providers). To date, local AICs, TSBs and other administrative enforcement authorities have been unable or unwilling to handle most online cases due in part to the lack of such powers. 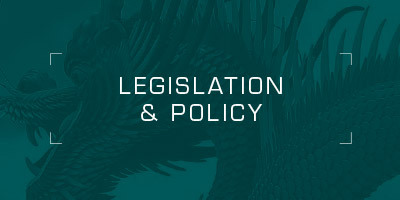 The draft law contains various provisions that clearly foresee self-policing by industry as a primary means of protecting IP and consumer interests, including through reliance on support from trade associations as well as alternative dispute resolution mechanisms, including mediation and arbitration. The Chinese government is experimenting with mediation and arbitration for patent disputes involving domestic parties.